Every child knows that running under a sprinkler or being sprayed by a water hose is a fun way to cool off on a hot summer day. Cool water always makes the summer’s heat tolerable and even enjoyable. You can offer the same relief from the heat to the birds in your backyard. By installing a simple bird bath, you will make your yard more attractive while also being able to enjoy the pleasure of watching a large variety of birds playing and splashing around in the cool pool of water. Your new bird bath doesn’t need to be expensive. It can be as simple as a shallow pan filled with water placed on your lawn. 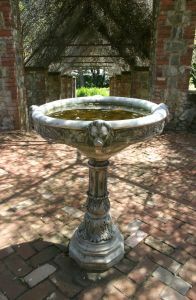 Or if you want to go all out, you can build or purchase an exquisite concrete bird bath complete with fountain. Or you can choose something in between. The choice is yours and the birds won’t care how much you spend. They’ll love whatever you provide for them to bathe and play in. There are a few things to consider when you place abird bath on your lawn or in your garden. Birds prefer shallow water (no more than 1-2 inches). If the water is deeper than that they will avoid it out of fear. Also, the bottom of the bird bath should have a fairly rough surface. Birds feel more comfortable when they have a solid footing. Garbage Can Lids: Set the lid in a shallow depression to prevent overturning, then partially fill with small rocks and stones and add water. Logs: Chisel out a shallow area on top of the log, then sand smooth, and add water. This is a very natural looking bird bath feature to add to any landscape. Clay Pot Saucers: Set beneath a large plant or shrub, or positioned on top of an upturned clay pot, these shallow saucers make ideal bird baths. Pie Plate: To make a hanging bird bath, set a ceramic, deep-dish pie plate on top of a hanging basket. Depth: Water in a bird bath should be no deeper than three inches. Height: Bird baths may be placed on the ground, on a raised pedestal or hung from a branch a few feet off the ground. Ground level baths have the added benefit of providing water for many small mammals such as squirrels, chipmunks and rabbits. However, bathing birds are extremely vulnerable to predators. If cats are in or around your yard, your bird bath should be raised above the ground. Dripping Water: Nothing attracts birds as quickly as dripping water. Some bird baths have fountains, but a water drip can be made easily. Take a plastic bottle or tin can and make a hole with a nail in the bottom or along the side just above the bottom. Attach the container to a branch several feet above the branch and fill it with water. This should provide a slow steady drip that will attract birds to your bath. Once they have found the bath, they should continue to visit it even when the water isn’t dripping. Care: Keep your bird bath filled with clean, fresh water at all times. A reliable source of water is important for attracting birds. Dump the water out and refill it every couple of days. Use a brush to remove any algae that may have grown. Never use any chemicals to control algae. Patricia’s Pots has detailed free instructions for making this beautiful Terra Cotta Bird Bath from clay pots. This faux classic stone bird bath competes effectively with real stone models. Lightweight yet substantial, it has a realistic textured surface and grainy stone color with a base that can be filled with sand or water. You should also place your bird bath in an open area of your lawn or garden. Predators such as cats like to hide in shrubs and foliage waiting for an opportunity to catch birds unaware. Birds prefer to have a clear view of the surrounding area so that they can keep an eye out for danger. If you follow these suggestions, you’ll have lots of birds that are eager to take advantage of your new bird bath! After you have found the most appropriate location for your bird bath and installed it, you can then concentrate on attracting the birds to it. Having a ready supply of food nearby is an excellent way to attract your feathered friends. If you keep a well-stocked bird feeder near the bird bath they will eat their fill and then splash around in the water for a few minutes. The sound of splashing water will also help attract birds to your bird bath. You should consider using a fountain with your bird bath (a simple water hose set to a fine mist will do). Also, if you water your lawn or garden, keeping the sprinkler set to a fine mist will make an attractive sound to entice birds from near and far. Always be sure to keep the bird bath clean. Dirt and waste can make birds sick. Also, birds need a steady supply of clean, cool water in order to remain healthy. Re-supply the bird bath with fresh water often during the hot summer months. Water evaporates quickly and it is splashed away to the ground by the birds. If possible, place your bird bath near some tree branches. If a tree is nearby, the birds will play in the branches after bathing, providing lots of enjoyment for you as well as for them! Your new bird bath will be a wonderful addition to your lawn and garden in the winter time as well as the summer. Although most plants go dormant in the winter, birds continue to need a water source and many local streams and ponds may well be frozen over and not provide the water they need in order to survive and remain healthy. Also, there are different species of birds around in the winter time as opposed to the summer. Be sure to keep your bird bath free of ice and filled with water during cold weather. The water is useless to birds if it is only available as a block of ice! A bird bath will add beauty to your lawn and provide year after year of pleasure, for you as well as for your feathered friends!